One word for this experience: magical. Whatever you do, don’t miss this. Sure the entire experience of Petra by day is different because, well, it’s a marvel. How often do you see a city carved into mountains and that too a pre-historic Nabataean caravan-city at that? 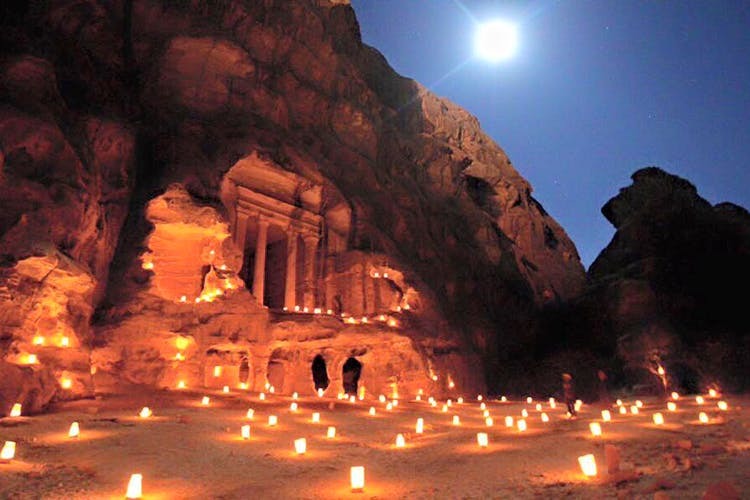 But at night, the entire path or Siq, leading up to the main city entrance and the iconic treasury façade, is lit up with candles. A sound and light show follows, with a Bedouin musician and story-teller taking centre-stage. A glass of herbal tea is part of the evening as you sit on mats and marvel at the landmark. Don’t skip it during the day though, it’s a different kind of amazing. Oh! And try checking into the Petra Guest House. Not only is it a few steps away from the entrance of the site, it’s also got a Cave Bar resembling a Nabatean cave.